American Community Bank has five branches in Indiana. Its small business offerings include business checking accounts, lending, merchant services, remote deposits, ACH banking, receivable financing, investments, and credit cards. We searched for American Community Bank reviews and found that it is rated 5 stars based on 29 Facebook reviews. Ready to get started with American Community Bank business checking? Apply now. American Community Bank has five branches in Indiana: Schererville, Crown Point, Dyer, Hammond, and Munster. You may view its branch locator to check which locations are closest to you. 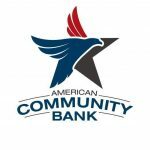 American Community Bank also offers business credit cards and different business lending, such as term loans, revolving lines of credit, land development and undeveloped land loans, SBA funding, commercial mortgages, and residential construction financing. It currently does not offer business savings, money market accounts, and wealth management. Find out more about its small business offerings on its website.